Shadow is a truly sweet soul who has obviously had a few trials in his life along the way ending up in a refuge again at the age of 7yrs . He was very quiet when he first arrived and we didn’t hear him bark for about a month . He was always just there , no real greeting or confirmation that he knew we existed . Christmas was a bit bewildering! Why were these people giving him squeeky toys , teddy and tennis balls ! What was he meant to do with them , he hadn’t a clue ! The wrapping paper was delicious !! Saucisson on the other hand !! He had stolen one whole saucisson & a baguette by christmas ! Now I have to point out that this was quite a feat , as he was unbelievably unfit & very very fat . His first walks consisted of going down the drive and back , then we progressed to walking to the first bend in the road , about 200m . Not only was he completely puffed on our return , but he was very stiff in his joints . We decided to give him a month of Corteflex , which did the job . He was less stiff and more able to continue with his fitness programme . He has managed to steal 2 more saucisson , but I blame us for turning our backs on him ! He knows the routine , people turn up for an apéro , out comes the saucisson , then we walk the people to their cars and voila , saucisson gone without a trace !! He has however done us proud by losing over 5k in 7months . He is truly obsessed with food , and once in his grasp you can just forget it !! 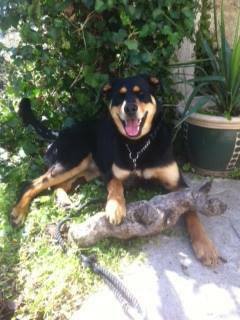 Shadow is an absolute poppet with all other dogs , irrespective of age & size . He has also been a diamond with our neighbours children , a 6yr old and twin 3yr olds ! He likes to chase the chickens when he’s feeling sporty , but it’s only a game ! He now greets us like a puppy whenever we come home and occasionally has been know to give us a cuddle ! He barks at any cars that arrive and defends his home with pride – if I didn’t know him , I don’t think I’d not take him seriously !! As sweet as he is , he’s been an education for us . Before Shadow we owned 3 weimaraners , a Retreiver , 2 Border Terriers and a Griffon . But taking on a rescue dog is a whole new ball game . I think we have had to be more patient with him than any of the others because he’s not a puppy , he has had problems , but therefore the reward we get when things start to come good is immense ! We have no regrets and I am now sure Shadow knows that this is his Forever home , chickens and all ! The pictures are November & now – I hope you can see a difference ! Two dogs that thought they had a home for life were abandoned at the SPA today. First was two-year old Zelda, who was adopted from us (as Zizouille) about a year ago. She is on the “no longer wanted” pile. BUT My new Mum, Jane found this picture of me, and you can see that now I have a different life altogether!! She had decided to volunteer at the SPA Carcassonne, and ventured into the “concrete jungle” initially December 2014. To return shortly after in March on a permanent basis…there was strict instruction from John to find a new member to the family but not a small dog! Well, an open brief and where to start, there was so many to choose from all barking for attention and affection but she kept returning to my home which I shared with a great dog Tazer. Initially I was very frightened and wouldn’t approach anybody, but with some support from Tazer and a treat…we became friends and went out for a walk together. Jane returned on several occasions as a new volunteer and although there were several new dogs, always sat with me and I enjoyed the cuddles that she gave me behind the bars…little did I realise that she had decided…I was going home. Jane shortened her last return to the UK and I was adopted on April 11th…ten days after my 2nd birthday….approximately 6 weeks at the SPA is unusual. We both started our journey together walking the vineyards near Brezilhac, and I soon found new friends as you can see from the pictures…socialisation is hard for me, and I am afraid of people, children, flags, loud noises and shoppings bags to name but a few, but in eight weeks we have made great improvements. I am very lucky as we have a small open garden where I can play with my various toys, and I am particularly good at football…OK I’ve destroyed a few and have thrown a few tennis balls down steep banks which both my new Dad and I have managed to retrieve…we have been to Mirepoix/Limoux markets as my Mum loves to source local fruit/veg and I generally always get a treat when she stops for coffee. Many people have approached me on these days out and I have even had photographs taken….today has been an adventure Toulouse airport….who know’s where we will be going next, such an adventure!! 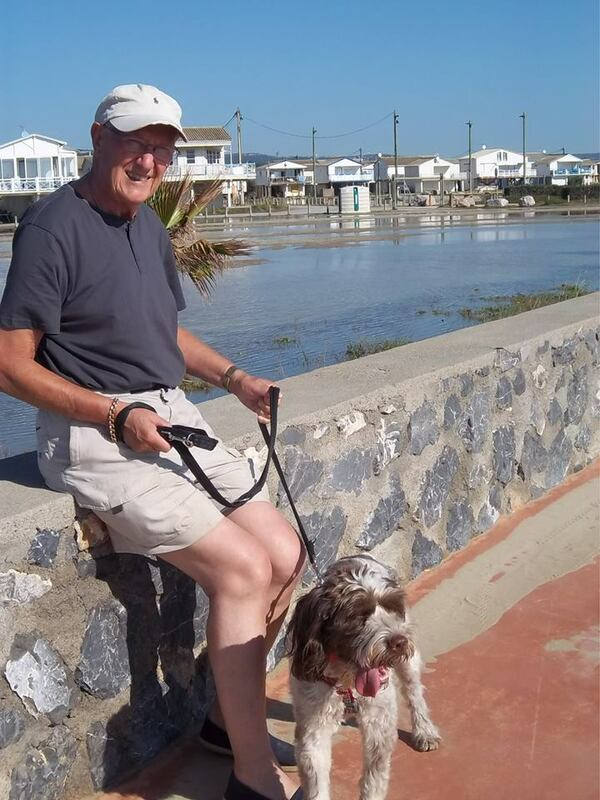 “A day in the life of a volunteer” Every Tuesday and Thursday afternoon I set off for the afternoon to the SPA Carcassonne….with so many dogs to walk I have to choose those that have not been walked recently…I was surprised it could be up to a week! I personally have a soft spot for the big dogs in their single boxes, and have built up my muscles in my right arm!! (thanks to Gus…lovely chap).They are all so very different when they are given the opportunity to get out… for anyone considering “adopting” please do not pass by those that look over excited, or retire to the back of their homes..just give them a second look. There are two tips I would give any new volunteer make sure you bring water as some days it has been over 30 degrees, and even though we don’t walk on those days…Cindy, Moira and myself washed three puppies for the first time it is thirsty work. Secondly, pair up with a friend, and enjoy the walks together this allows those dogs that are homed in pairs to go for a walk together, and it is great to see the difference. When you have the time get the brush out…with the warmer weather some of the dogs are losing their winter coats and is great to see how they appreciate the cuddles and warmth that you can provide…it always gives me great satisfaction to see the “older dogs” adopted and see them off with their new owners. Anyway back tomorrow with my daughter to show her the ropes and despite the weather, a walk and a smile costs nothing. After the birth of our second daughter and reducing my working hours to part-time, my partner and I felt the time was right to finally add a canine member to our family. I had grown up with spaniels (English Springers and a Brittany Spaniel), and Paul grew up with various breeds, from terriers to poodles. We already had 2 cats (Fonzi, a Burmese, and Cleo, an Egyptian Mau X Bengal). But because we had both worked full-time we did not think it was fair to have a dog we could not commit the time to. My experience of dogs was such that I knew it’s not just about taking care of their physical needs but also their emotional needs. We did not want to buy from a breeder over here: A : because it’s so expensive, B: because we liked the thought of being able to help a dog who had been given a rubbish deal in life, and finally C: I fell in love with Garf at first sight. After trawling through pages and pages on google of UK dog rescue centres, and unsuccessfully trying to find a spaniel or a hound that was good with kids, and was still young enough for the kids to grow up with, I accidently stumbled across the SPA Carcassonne page. I could not believe all the lovely looking dogs looking for a new home. Garf took my eye straight away, as he was obviously a Brittany Spaniel and so beautiful. I was also keen on an older Brittany spaniel, however we felt Garf maybe too lively for him to handle. As luck would have it my mum decided she wanted the older Brittany (Eclat – who we call ‘Clay’). After a year of having Garf in our lives, and feeling he was suitably settled and happy, we decided to give him a pal. When a Brittany spaniel puppy appeared on the SPA website we thought she would be ideal as being a puppy she would be more likely to be accepted by Garf. The idea being she would accept his position as leader and be his subordinate. Hmmmmm, enter Pip, she had other ideas. She is a very lovely, but bossy little sister for Garf, just as well he is now a chilled out sort of dude! We purchased a dog crate after about 2 weeks of Pip’s arrival, it has been a brilliant buy. She sleeps in it and it also means Garf isn’t harassed at night by her. What if something goes wrong afterwards? E.g the dog is aggressive with the kids? Good communication with staff at the SPA throughout the process, very helpful and reassuring – and I liked that Moira was Scottish! We trusted them. The SPA sorted vaccinations, passports, transport, and this with cost of the dog was very low compared to theUK. Finding a Brittany Spaniel rescue is a rare thing. 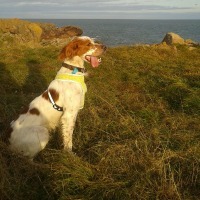 Brittany Spaniel X Setter, 2.5 years of age at time of rescue. Issues: Hyper, sensitive tummy, pulling on lead, Poor recall. Needs: Plenty of walks, to run off the lead, cuddles, Sensitive dog food, PATIENCE. his calibre in the whole of the UK – I looked! Brittany Spaniel X ?, 6 months of age at time of rescue. Garf about – bit jealous when he gets cuddles, doesn’t seem too keen on learning basic commands. hand! ), cuddles, a patient big brother (cue Garf! ), exercise, not to be overfed. Pros: She is great with the kids, cuddly, loves people, friendly with other dogs, keeps Garf entertained, good on the lead, excellent recall, loyal. My mum adopted Clay, as mentioned earlier, he was around 9 years of age when she got him. We initially thought we may only have him for 1 or 2 years as he seemed like he had a rough time in life, appearing weathered. He literally had no issues behaviourally. He and mum ‘clicked’ straight away, he is calm and loving. He is super with the kids, and would make an ideal Therapet. He had to get a lot of teeth out when mum first got him, and has a touch of arthritis, but he is happy and has such a glossy coat now. He is mum’s ‘wingman’ and goes with her when she is out and about in the car and such like. I guess we have been lucky that I stumbled across the SPA website that day, we have ended up with such lovely additions to the family. We took the ‘risk’ and it paid off, I would only ever choose a rescue dog from now on. It doesn’t make sense to pay hundreds of pounds for a puppy when there is such an abundance of great rescue puppys/dogs needing a better deal. There are risks involved in any form of dog ownership, the most important thing would be to research it fully before you make a decision and make sure you know what to expect, be prepared and be patient! If a dog can trust and love a human again and give us a second chance, then it’s probably not too much to ask for the same in return. The Emslie-Fyfe family, Aberdeenshire, Scotland. 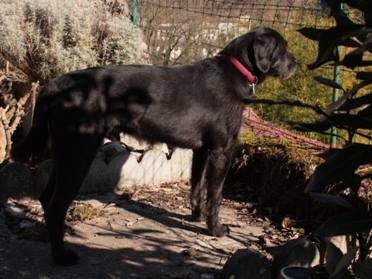 In December 2014, I went to SPA Carcassonne looking for a medium-sized, 3 to 7-year-old, easy-going, low maintenance dog that would get on with my neighbours’ griffon fauve de Bretagne, Gaspard, possibly a griffon cross or Brittany spaniel. Though he wasn’t on my list of candidate dogs. I was introduced first to Echo, but he was very shy, reluctant to meet me and, though he was a black griffon cross of the right size and body type, I wanted to get on and see the dogs I’d picked from the website. However, none of them appealed to me; they were either too big, overweight (I like slim, wiry dogs), too bouncy, young or not housetrained. I was attracted to a lovely black labrador, who seemed determined to make eye contact, but was told he didn’t get on with other male dogs. I asked to have another look at Echo. 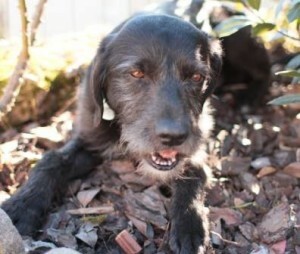 On the website, he was described as a “good-looking”, griffon-cross, the photo showed schnauzer-type face furnishings, which I didn’t like much and a mad look in his eyes. In fact, he had lost all his face furnishings except a straggly beard (possibly through stress), had a goofy look because of his undershot jaw and just looked like a slightly ridiculous black mutt, which I did find quite appealing. We went for a walk, Echo’s tail went up from between his legs and even gave a little wag and when we came back I asked to reserve him. A couple of weeks later, I took him home. When introduced to his dog bed with fitted sofa-type cushion (chosen because it can be easily washed), Echo plunged nose-first into it, snuggling and wriggling into every conceivable position a dog could be comfortable in. His evident love of comfort made me think of the other dogs facing a cold winter on the concrete floors of their boxes and wish I could manage more than one dog. I was completely ignorant about French scent hounds, except for the neighbours’ dog. I’d previously had a miniature poodle as a child and, later, a pointer cross acquired as a tiny puppy. A seven-year-old rescue dog of a totally different type was a leap in the dark. I was delighted to find I had adopted an affable, self-contained dog who is totally housetrained and has a minimal amount of basic training (sit, stay, go to bed and sitting for his lead to be put on), doesn’t jump up and lick people, doesn’t chew things he shouldn’t, who rarely barks or growls and never whines, but does bark when he hears a stranger approaching the house. He seems content to be alone downstairs or in the garden while I am working in my office upstairs, loves going for walks and for trips in the car. The house is on the side of a small mountain and Echo’s favourite place in the garden is the corner, overlooking a neighbouring garden, where a cat suns itself on the letterbox, and the street 15 metres below. Initial power struggles over sitting on the sofa have now been resolved: no he can’t. On the negative side, he’s not terribly bright when it comes to training and cannot be trusted off lead. Echo seems to have been mistreated in the past, he was terrified (now downgraded to scared) of new people, especially men, crowded places and noise. He cowered, clearly expecting to be hit when a friend made a gesture, raising her arm. Gradually he is getting more confident and more affectionate, especially since I established myself as pack leader by not letting him walk ahead of me or eat before I do. Those last two changes seem to have made him less stressed and he has begun to walk through town with his tail in the air, rather than between his legs. The fur is growing back on his snout, which had become rather bald on top and his ridiculous eyebrows and moustache (which I’ve only seen in a picture from last summer), show signs of sprouting anew. About a week after coming to live with me, returning from a long walk, Echo did a little play bow and intimated that he’d like to walk off lead like Gaspard. Foolishly, thinking he just wanted to get home and have his delayed breakfast, I let him off the lead. He shot away up the lane and past the house. I followed calling him; he came halfway back and then rocketed up the path that leads to the top of the mountain. I followed and saw him sniffing something interesting about 200 m ahead of me. I called him; he looked and ran off up the path and out of sight. A couple of minutes later, he came flying down towards me at about 50 km an hour and carried on past for 100 m, turned again and rocketed up past me and up another path into the trees. I stayed still, calling him from time to time and eventually he came back just long enough to wolf down some treats and be caught. A few days later I let him off the lead somewhere a bit safer, where he was less likely to get out of sight. After about 2 km of high-powered running around, he came back and was suitably rewarded, (in spite of the times he’d been called and hadn’t come back). Thinking he must be tired, and as he showed an inclination, when we got home, to explore up the mountain again, I let him off the lead. He disappeared out of sight before I could blink and calling produced no results. Eventually, just as I thought that I would simply have to go home and wait for him to come back, he came tearing back, closely followed by a large off-lead husky, and let me clip his lead on in return for a treat and hiding behind me. Fortunately the husky turned out to be friendly. There was another incident soon after, when Echo wriggled past me before I could put his lead on for our evening walk. He disappeared up the mountain behind the house. I called him for about 10 minutes, then went back indoors. The heavy rain forecast for the next three days soon started. I phoned Moira from the SPA and followed her advice to leave the back gate and the downstairs shutters open and the lights on outside. Hours passed and there was no sign of Echo. I started to think he was gone for good and felt really sad looking at his empty dog bed. I stayed up working upstairs, but came down for a last check at midnight. A soaking wet, miserable hound was shivering outside the patio door, silently staring in. Having been towelled down and blowdried, he hid behind the furniture, expecting to be punished. Since that night, he seems to realise that he will not get hit for being a naughty dog and is more affectionate. I have bought a 10 m lead for recall training, but don’t know whether he will ever have a reliable recall. One morning, coming back up the lane from the market with my hands full of shopping, Echo (who was on the lead) plunged his head into the ivy hanging down a wall and emerged with a struggling black and white cat in his jaws. I shrieked and slapped him and the cat managed to get away, leaving a large chunk of what happily turned out just to be fur in Echo’s mouth and a look of mixed triumph and disappointment on his face! I reminded myself that he’s a hound and hounds are bred to hunt, so it’s not his fault. He seemed very puzzled at my negative reaction. There are very big advantages with adopting an older dog as they are calmer and less demanding than a puppy or a youngster and still trainable. A small or medium-sized seven-year-old dog is only middle-aged. You don’t have to guess what the dog will look like or how big it will be when it grows up and you can see its basic character. Though the effects of any past mistreatment or lack of early socialisation may never completely disappear, that applies to younger dogs too. I’m really pleased with Echo’s progress over the past month and sure that he will continue to become more confident and learn new things. Roadie arrived at SPA Carcassonne in very poor shape, having been abandoned on a main road (hence the name), and found seriously injured. He spent several weeks in the refuge’s infirmary and staff were not sure that he would pull through. It’s too distressing to give details of his injuries. After lots of patient care he was released from intensive care and came out for a walk in the February sunshine before being assigned a kennel. I walk dogs at SPA and was one of the first people he saw when he came out and, timid as he was, he came up for a cuddle. It wasn’t exactly love at first sight for either of us but I decided to foster him that same day so that he didn’t have to be kenneled. My partner and I had been considering a second dog as company for our eight-year old Alsatian-Boxer cross, Flora. Roadie and I travelled home to meet the family. He was very wary of his new surroundings and of his new big sister. Flora, for her part, was miffed at not having been consulted, but tolerated the newcomer on the understanding that we’d be taking him back to where he came from asap. It took a long time for her to accept him, afterall, she’d been an only child for eight years but she’s great with him now, so long as he remembers who is top dog. As new retirees currently living in France with our four year old Jack Russell, it seemed an ideal time to adopt another dog. After making enquiries we found the SPA Carcassonne, the best & most regularly updated website in the area, in our opinion. We had already decided that we would prefer a younger female dog to join our family. 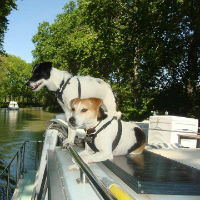 From the information on the website several dogs caught our eye so we telephoned and made an appointment to visit. There are so many deserving dogs at the SPA, it would be easy to adopt half a dozen! All we know about Clara is that she was abandoned at the gate with her brother and at just over a year old were potentially unwanted (unsold) puppies? She was quite ill at first with a stomach upset so couldn’t come out to meet us straight away but once we saw her it was love at first sight. So with an open day coming up we reserved Clara on the spot just in case she caught someone else’s eye! Our second visit was to introduce the two dogs & to check their compatibility. They were quite neutral towards each other, no apparent problems although when she tried to lick him he didn’t look too impressed! We made the decision to adopt there and then & having completed the paperwork she was ours. We knew it would take time & patience to welcome this abandoned puppy into our home, so we tried to slowly introduce them and avoid any confrontation. At first all seemed OK, both dogs were accepting of each other & played in the garden. However, there soon started to be an element of jealously, Clara was obviously desperate for our affection and tried to push Jackson out of the way and growled at him when he came near us or wanted to sit on our laps. Bedtime was a struggle over who was top dog and we had to separate them. The next day it all escalated, they attacked each other over their food bowls even though we had fed them separately, they totally locked onto each other and we had difficult prising them apart. Jackson bit Clara’s ear and she bit his lip, they drew blood, really got quite nasty. There were subsequent fights over and at one point it took a dousing with a bucket of water to separate them! During those first few days it was so upsetting to see them both so hostile towards each other. We were even having doubts that the adoption was ever going to work but were determined not to give up. The team at the SPA were really supportive and on hand with good advice &, advising us how to look for & remove any “triggers”. Another piece of good advice was to encourage positive behaviours to make them a “team” such as walking them side by side & doing basic training together. From a health point of view, Clara’s stitches became infected and on closer examination our vet also noticed that she had a lump (trauma) at the base of her rib cage, probably from being hit or kicked. We were asked to monitor it & thankfully it disappeared within a few weeks. Clara didn’t arrive without issues. She is still a little nervous, suffers from separation anxiety (we are careful not to leave her on her own for very long) has problems with toilet training – never mind she is now nearly two years old it has been totally back to basics! 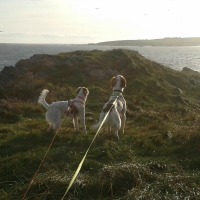 Car journeys & general socialisation with other dogs off lead was also an initial problem. BUT nothing is insurmountable and a bit of love & patience goes a long way! So here we are 6 months on, with our new family, Clara is such a sweet affectionate dog who just wants to be loved & cuddled. She wakes us up every morning with big licks and loves to have her tummy rubbed! We’ve had a fabulous summer together , both dogs are now best of friends and absolutely inseparable and it’s lovely to see how their body language mirrors each other when they are playing or sleeping. Jackson is so happy with his new “petite copine” and now we can’t imagine life without Clara, our beautiful rescue puppy who never stops smiling! I can still remember the day we brought Benson home. 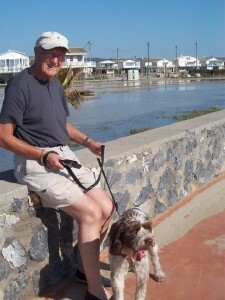 My partner James and I had just finished an afternoon of dog walking at the SPA Carcassonne. Rowan, the former President of the refuge, told us to go look at the ‘ball of fluff’ that had just been brought in by the Gendarmes. We strolled over to the office to see Carole, the refuge secretary, holding onto a frightened, thin, and grubby little dog …his owner had been hospitalised and neglected to mention that she had a dog at home. Three days without food and water had passed by the time he was found. He was traumatised and needed a quiet place to recuperate from his ordeal. James and I agreed to foster him until his 10 days ‘pound time’ was over. I held him in my arms on the drive home, reassuringly stroking him. He stunk of stale cigarettes….so we named him Benson! 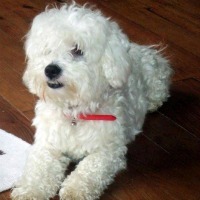 It was not long before we realised that Benson had been mistreated by his former owner. Over the next 10 days, he slowly put on weight and became more comfortable around us. We took him everywhere; he loved meeting other dogs and especially loved been taken out for walks. 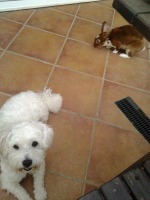 After careful introductions to our other resident animals, my three houserabbits, we decided that we would adopt Benson. This little Coton de Tulear had stolen my heart. A few months passed and Benson’s confidence around us grew, but the realities of both his lack of socialisation and mistreatment became apparent. Benson was fearful of certain people and exhibited fear aggression. He cowered at the sight of a broom or at a hand raised anywhere near him (unintentionally of course). Living isolated in an apartment meant that certain outside noise absolutely terrified him. We were at our wits end; seeing our little chap petrified by certain people and things was stressful…for both him and us! On advice from Rowan and Moira, we decided to enrol Benson in dog training classes at a bilingual club in Azille. Shirley, the trainer, agreed that he needed socialisation and helped us to develop strategies to cope with his anxieties. Shirley, who has two rescue dogs herself, explained that Benson would be gently socialised with other people whilst learning new things and making new friends, both human and canine. Slowly but surely, Benson has become a different dog. Although he is still fearful of certain people and noise, he is certainly less anxious in those situations. We now know that there is no ‘quick fix’ for anxiety issues, and he will always have insecurities. We want him to feel safe and secure and try to manage situations where he feels threatened. A rescue dog is like a box of chocolates, you never know what you are going to get. It has been a long, tough journey but I would not give him up for the world. As James puts it, he is our ‘dear little chap’. We wanted a dog but it wasn’t supposed to happen until I joined my husband in full time retirement in our house in France. 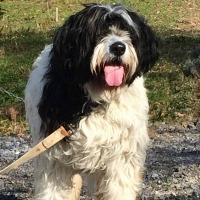 However the sight of a scruffy, hairy Griffon Korthal cross called Pollux on the SPA Carcassonne website changed all that! We collected our handsome boy from the SPA in Carcassonne on 25th September last year and, despite never having seen him in the flesh before, fell immediately in love with him. Moira and Rowan took care of all the adoption process over the phone and by e-mail. So, with the paperwork completed and farewell tears shed by volunteers, we began the long drive back to the Lot Valley and Pollux’s new home. Yes, we kept the name Pollux, which always causes great hilarity amongst our English speaking friends, although it is actually the French equivalent of Dougal from the children’s TV programme “The Magic Roundabout”. It is, however, a popular dogs’ name in France and many of our French friends and neighbours talk fondly of their own dogs who were also called Pollux. In fact, more people know his name than know ours and he often gets a “Bonjour Pollux” from the local bar as we pass. I can’t say that the whole experience has been a breeze and sometimes it has been quite hard but with a lot of patience we have all settled down to a happy life together. When he first arrived home, Pollux preferred to stay outside on the terrace and only came into the house to sleep at night. He had to be coaxed into eating and practically fed by hand to get him to eat anything – so different from now when his food is wolfed down in less than 5 seconds. On the positive side, he did sleep through the night without any crying or barking and was housetrained. Well I say housetrained, he did have a problem in that he peed every time he was excited or frightened, which in those first few months happened very frequently. We have since been told that this is a well-known problem with Springer Spaniels, so maybe that’s who his dad was. Anyway, he is getting so much better with that little problem and it is now safe for us to go upstairs and come back down without having to stand with our legs spread to avoid the unavoidable excited wee and yet another change of clothes. Pollux was, and still is to some degree, wary of men, sticks and big gloves. We don’t know what his background was but there does seem to have been some sort of ill-treatment at some point. He also didn’t like the broom or vacuum cleaner but he is getting better with them as he realises what they are and they are not going to hurt him. People always ask us what language we speak to a French rescue dog in, well we have always spoken to him in English but he certainly understands the word biscuit in many different languages now. As the weeks and months go by we are always learning new things and have recently enjoyed our first seaside holiday together. Pollux really loved the beach and the sea and impressed us by lying down in restaurants so that we could actually eat out. He is a real comedian and can make us laugh out loud with his antics and funny ways. He is also very affectionate and loves having a cuddle, leaning in hard against our legs or snuggling up on the sofa to watch television. He is quite selective with his television likes and dislikes and has taken to growling at Prince Charles, Ed Balls and Alexander the meerkat on the TV advert which now means we have to distract him whenever they come on. We are so pleased to have adopted him and he has brought us a lot of love, happiness and laughter over this past year. Thank you Dog Rescue Carcassonne for bringing Pollux into our lives. We are a couple in our 40s living in a spacious French house surrounded by the wonderful Languedoc countryside. Neither of us would describe ourselves as “dog-obsessed” – but we did love one particular dog, a Weimaraner who died in January (very suddenly aged almost 9) from bloat. The big empty space he left in our lives was ghastly. Life just wasn’t the same without those extra feet. In the first instance we had no plans to get another dog and we donated his food and treats to the SPA and thought perhaps we might see a new 4-legged friend to bring home. I liked a young spaniel cross but my partner just couldn’t feel a bond and we returned to our large empty dog-less space empty-handed. 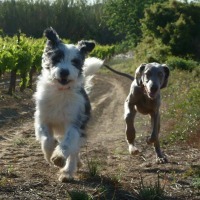 Anyone who has owned a pedigree will know how attached and familiar you can become to the traits of a particular breed. So at the end of February a new Weim pup entered our lives but we continued to check the SPA Facebook page on a daily basis “just in case”. We had talked many times about having 2 dogs and now we had the chance to make it happen. 4 weeks later we spotted a shaggy black and white dog (named Vania by the staff) on the Facebook page – about a year old, with hardly information about her past. I was passing through Carcassonne and called in to see her just after receiving the devastating news my mother had just died. As fate had it, that small(ish) scruffy mutt happened to be on a walk as I walked in, she sat calmly on my foot almost as if she knew I had come specially to see her and would one day take her to her forever home. My partner later visited the SPA and took Vania for a couple of short walks while I was away, and it was rapidly decided we wanted to bring her home – but there were complications in adopting a rescue dog so soon. We could not do it whilst having a young (not fully inoculated) pup at home. So we found a friend that “might” take her for some of the time but only on the condition the dog was flea-free and child-friendly. All these circumstances were definitely not straightforward but thanks to an amazing network of “SPA helpers” a lovely foster family agreed to take Vania for an extra fortnight to help us out. During this period they fed, walked and wormed her (she was riddled with them), and took the time to update us on how she was adapting to a home life beyond bars. Vania then went to stay with our friend round the corner so we could introduce her to our pup on neutral ground – which as it turns out was barely necessary. “Mattie” as we have named her, played and snuggled up with our pup straightaway and has done so to this day. What we had not bargained on, was waking up (for what seemed like weeks) to a shaggy unknown dog covered in its own diarrhoea and a shoe-chewer terrified of most men, hair brushes or people coming downstairs. A new set of challenges presented themselves. We are still working on the hair brush phobia, but the other issues have largely been resolved by plenty of cuddles and exercise, some very basic training, along with a change of diet and a lot of socialisation with people and other dogs. Mattie has been such a hit that we have even been offered money to take her off our hands! She grows more confident in her surroundings by the day, is boisterously playful but still rather unpredictable and there are very occasional toilet-training accidents indoors. Her history is a mystery so we just don’t know why she reacts to certain things the way she does. It’s taken 8 months of adjustment and the learning curve is continual although certainly not as steep. To anyone that has lost a special dog, or is considering a new adoption, we’d never say it’s easy, comparisons will be made, what works for one dog probably won’t for another. But the foster families, the follow-up advice from the SPA, a lot of patience and industrial amounts of kitchen roll have helped us along the way. Mattie now seems to “smile” her way through life – she’s great fun, very entertaining and incredibly affectionate. She has definitely found a place in our hearts and we can’t imagine her living with anyone else. 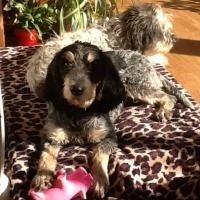 Our friends say they’d like to find a dog as lovely as Mattie, and we just say go and see the dogs at Carcassonne SPA! As a side note, Mattie’s influence on the Weimaraner is interesting. He started out as quite a handful, very confident and potentially dominant. After several months play-fighting with Mattie, he is very funny, very cuddly and sociable with anyone, no matter how many legs they have. She has taught him a lot, and in return she is picking up basic obedience by watching him – so both characters are balancing each other well and we feel lucky to have two such lovely dogs. We set off from our house in Esperaza, on a very hot August afternoon to visit Malaga (now Maddie) a young Griffon Bleu de Gascogne who had been abandoned by the Chasse and was being cared for at the SPA in Carcassonne. On arrival we waited for about ten minutes behind an English family that seemed to be very excited about getting a dog from the refuge. After they left we met Moira who set off to get Malaga from her kennel. I was quite taken aback as to how terrified she was of us and was concerned she would break out of her collar in an attempt to get away from us. Moira quickly suggested that she take her to an enclosed field where we could try and get to know her. She was so terrified she just ran around the perimeter of the fence and we went and sat in the shade under a tree and had a good old doggy chat. I remember giggling at the dog in the next field who was playing with a rubber kong in a paddling pool, very scruffy looking and covered in mud. ( turned out it was the dog that was going to the family before us in the queue….Pitchou). He was having a great time in the water and about to go off on a new adventure to his new family. Malaga however was still circling the park keeping well away. We continued to chat about the dogs and after about 20 mins she came and sat beside me. Decision made, she was coming to Scotland. Moira very kindly arranged transport for her and when she arrived at our house she was still quite traumatised, constantly circling… she was too scared to come in the back door and she was so thin she could run through the bars of our garden gate. However two months down the line with a lot of patience and lots of cuddles she has transformed into quite a rowdy but extremely lovable dog. Very boisterous first thing in the morning throwing her toys around and galloping around. She loves to chase the rabbits round our (large) garden. She comes back 99% of the time to a gundog whistle even though she’s a hound! She sits (for a bit of sausage) and walks relatively well on the lead. She loves to go walks and is keen to meet other people but still is a bit wary of strangers if they try to speak to her. Every day she is getting better though. 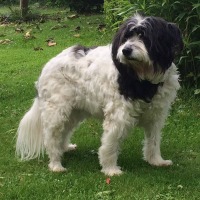 A lot of the credit for her quick transformation must go to my lovely two Petit Basset Griffon Vendeens who are very relaxed and calm and have shown her the way – oh and yes the hubby too. I do think however they were secretly hoping that she was only staying for the weekend. She still needs to meet more people and experience more things so we have decided to enrol her at a local training class. Maddie is a joy to live with, very affectionate, very inquisitive, very funny and happy to please. We are very lucky to have her and we must thank all the good folks at the SPA for the fantastic work they do.